It was the 66th commencement for graduates of Brandeis University, my younger son getting his Bachelor degree. Graduations can be rather tedious for graduates, family, and friends and then again you can be moved by a speaker. The day though was reserved for a final speech by a young man receiving his Ph.D. in Neuroscience. He has a distinctive look and name and his talk is attached here in full. Please pay attention to his use of language, to his use of hand gestures and to the spirit that shines forth from this young man studying how human (brains) learn to balance—and how he implores us in his talk to commit to holding opposites. Dear Mother Earth who has given us all life and my beautiful Brandeis family. Today we momentarily rest upon the moving tectonic plates of destiny, where we can smell the freshly pressed and compressed for a view of nostalgia and where glistening all around us is a constellation of celebration. Am I right? And as you run and run and run, holding your shattered heart, you ask, “Why did I ever even do this?” We did it because we want to live and we want to dream and fall in love with something beautiful. We did it because we want to explore the vastness of the universe and give birth to an idea never before seen in the entire history of humanity and to reach it, we have spent years with recurrent devotion and a singular focus on an incrementally small thesis, waiting for our truth unto its innermost parts to emerge from a primordial soup of knowledge. It is this training that has opened our divine eye and allowed us to see within every infinitesimal drop an infinite universe of beauty upon which we can build our palace of collaboration. And to many others, this world may be boring and drenched in monotony, but not to us. We do not demonize bacteria, viruses, and venom. We find beauty in them and we make them our allies in the battle against diseases. And we know that within the piles of violence, hatred, aggression, and everything that divides us are the dormant seeds of beauty, which if we can find and study and hydrate, one day they will grow to be trees of peace and love. This is our world and our destiny and our time. Our muscles are ready and it’s time to lift this world out of despair. The true destiny of humanity is not to hibernate and divide its silos of seclusion, but to rather resonate in harmony with a united humanity. But how can we unite a divided world? It seems impossible, and yet, we have already begun, because within this auditorium, this a-gymnatorium, we have people from nearly all nations sitting united together as a singular family, bathed in a collective happiness. All that we need to do is grasp and nurture these connections and never let go, and as we disseminate across the planet, our network of love will expand and span across all nations, and nothing will be able to stop us, especially if we actively bring people with opposing views into our families, and through conversations, navigate around the fangs of differences to find the fertile crescent of commonality. There will always be those that say, “Don’t interact with the other side,” but let those philosophical extremophiles on both sides live in their sulfuric underwater volcanoes of hatred. We, the creatures of ambivalence, realize that there must exist both hot and cold, for the winds of change to flow, and with persistent hard work and collaboration and the consumption of our arrogance, both sides will scale across the vast chasm of differences and find a commonality that will change the topography of the world, eventually bringing together polar opposites. And to my beautiful United States of America, diversity can divide, but only if you don’t moisturize with love. If America’s identity is innovation, then we are blessed with the tools of collaboration. We can walk into any cafeteria and find Americans that have roots meandering into every known nation. Only here can we assemble a small united nations every time that we go and party, and only here can we create a multinational business or NGO or collaboration that can span the entire planet. Our greatest asset is not fracking oil, but rather friendshipping humans. If we can generalize these solutions together, we can solve some of humanities’ most unsurmountable problems. That is why when I look across the beautiful landscape of America, I do not see rusted tombstones, but rather resilient towns waiting for the monsoons of collaboration that we will bring to form nourishing rivers that spread like capillaries across all the lands, and I do not see American carnage, but rather American collaboration that will bring together all the divided nations of this world. And to all of us, we will create a beauty that has never been seen before. We will devote our hearts and souls and walk through the world’s hatred and sins to give birth to the next era of humanity – that of collaboration and unity. We will reconnect our severed umbilical cord with Mother Earth and never let her be disrespected again, and we will bring honor and pride to our loved ones that have passed away. Because some of us have lost our families, our friends, and even our precious classmates. 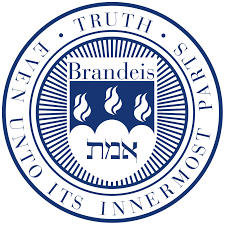 So goodbye, Brandeis. Goodbye divine pond that reflects the passage of seasons. Goodbye turkeys, rabbits, squirrels, and especially lab rats. Goodbye mountain upon which Brandeis is built that has given us all buns of steel. Goodbye weight room that has a womb-like warmth incubated by a mixture of both local and international body odors. Goodbye magical castle that will forever live in our hearts. And most of all, goodbye my beautiful Brandeis family. It’s Vivekanand Vimal’s job to turn the world upside down. Vimal, a PhD student in the Ashton Graybiel Spatial Orientation Lab, studies how humans learn to balance when normal gravitational cues are altered. He blindfolds volunteers, straps them into a lumbering machine — nicknamed “the Hulk” — and spins them up and down, back and forth, left and right. It may sound and look like a medieval torture device, but Vimal is collecting valuable data about how the brain responds, learns and adapts without gravitational clues. It’s important research for long-term space travel. It’s also a metaphor for Vimal’s life. Vimal has spent his life turning his own world upside down and sideways. Vimal is sharing those lessons with young people as part of an outreach program he created that connects Waltham high school students with Brandeis scientists and lab research. In 2012, Vimal developed a summer internship for students interested in science and research. This winter, Vimal, Anique Olivier-Mason, director of education, outreach and diversity at Brandeis MRSEC, and Marisa Maddox, a biology teacher at Waltham high school, launched a series of lunchtime talks at Waltham high with Brandeis University graduate students and postdocs. “I want to show students that they can be creative and produce something really beautiful and amazing even if they don’t have the best grades,” Vimal says. Growing up in Lexington, Mass., Vimal had bad grades and would spend hours daydreaming instead of doing homework. “I felt like I wasn’t smart and like I couldn’t do anything to change who I was,” he says. In college, however, Vimal upended that idea. The student who barely scraped by in high school majored in physics and minored in mathematics and computer science at Boston University. The kid who never played sports joined the Marine Corps’ Officer Candidates School. Vimal spent two summers testing his endurance with 12-mile hikes in full combat gear, tackling obstacle courses and conditioning himself for combat. The intensity and physical challenge gave Vimal more confidence and a greater sense of self. “It really helped develop who I turned out to be,” he says. After graduating, Vimal was offered a commission of second lieutenant but decided to take another path — it was time to look at the world differently. He let his hair grow out and promised himself that he wouldn’t cut it until he felt he had made a difference in the world. What skills would he need to make that difference? First, he would need to overcome his fear of public speaking. He applied for a teaching position at Waltham High School. He says he was nervous everyday over the next two years he walked into the classroom to teach physics. Despite his growing locks and eccentric teaching style, Vimal was accepted in the Waltham community. And, for six years, Vimal (and his hair) grew. Then, it was time to look at the world differently. Vimal took a leave of absence, shaved his head and moved to India to work for an a non-government organization. He made documentary films about climate change and child welfare, wrote grants, and traveled around the country. When he returned to Waltham, he decided to go to graduate school. As a teacher at Waltham High, Vimal had taken classes at Brandeis and became intrigued with neuroscience. Vimal completes his PhD next year. After that — who knows?